Clean Freaks is a full service professional cleaning service. We offer a variety of services tailored to the needs of owners to keep a clean home or business inside & out. two profiles were found for Cleanfreaks.net in social networks. Among other social networks the website is represented in Twitter and Pinterest. 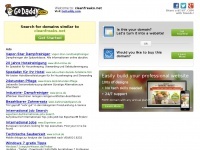 The web server used by Cleanfreaks.net is located in Scottsdale, USA and is run by GoDaddy.com, LLC. This web server runs 9 other websites, their language is mostly english. A Apache server hosts the websites of Cleanfreaks.net. XHTML 1.0 Transitional is used as markup language on the webpages. The website does not specify details about the inclusion of its content in search engines. For this reason the content will be included by search engines.